NABARD Recruitment 2017 published a Bank Job Recruitment Vacancy on their latest notification job advertisement for the post of Assistant Manager to apply as soon as possible by interested candidates. The National Bank For Agriculture And Rural Development NABARD 2017 hiring now & open job vacancies to fill Graduates & Post Graduates candidate for an Assistant Manager post open to apply for an eligible person. Applicants who do their Graduates & Post Graduates can do apply for this job recruitment offered by NABARD. They want to recruit total 91 posts to fill the post of Assistant Manager, However, Graduates & Post Graduates can able to apply before the last date reaches. If you are interested and Graduates & Post Graduate student then must have to apply before 10/07/2017. They want to collect job application to send through the Online method only by all eligible candidates. Eligible students can accept to send and apply by online for an Assistant Manager job post on or before 10/07/2017. Try to read each and all job information before applying to Assistant Manager job like post vacancy, salary, job process for selection, minimum qualifications, age limit, fees to pay if any, how to apply for this job and many other details to read. Check details properly and then only apply for this job opportunity provided by NABARD Recruitment 2017. We already mentioned that you can send your job application online method only. Job Address: National Bank For Agriculture And Rural Development, Mumbai. NABARD National Bank For Agriculture And Rural Development recruitment is going on for the jobs posting of Assistant Manager job openings to fill their job vacancy in their Main Branch Office of NABARD Recruitment 2017, Mumbai. So, Apply now to this latest job opportunity and fill total 91 job post vacancy to work as an Assistant Manager. Read all essential details below for more about job information which is required to know before applying in NABARD Job 2017. Eligibility Requirements: Kindly read all the below eligibility details for all sectors before applying to NABARD recruitment for an Assistant manager job vacancy. For general category, students have a bachelor’s degree in any subject from any reputed University with a minimum of 50% marks. For SC, ST, PWD applicants minimum of 45% marks in aggregate or Post Graduate degree with a minimum of 50% marks & for SC, ST, PWD students min. of 45% scores in aggregate or Ph.D.
And for other categories such as Economics, Agriculture, Agricultural Engineering, Plantation & Horticulture, Animal Husbandry or Veterinary Sciences, Fisheries Science, Food Processing or Food Technology, Forestry, Environmental Science or Environmental Engineering, Water Resource Development and Management, Social Work, Chartered Accountant, Company Secretary etc required minimum graduate or post graduate degree from any reputed Institute or University or membership with aggregate required scores. Age Limit: All the candidates must be between 21 to 30 years of age as on 01/06/2017, that means the candidate must have been born not earlier than 02/06/1987 and not later than 01/06/1996. Salary Pay: Selected candidates will offer a starting basic pay of Rs.28,150/- pm in the scale of 28150-1550(4) to 34350-1750(7) to 46600 –EB to 1750(4) to 53600-2000(1) to 55600 applicable to Officers in Grade ‘A’ and they will be eligible for DA, Local Compensation Allowance, (HRA) House Rent Allowance, and other Grade Allowance as per conditions apply from future times. At immediate, starting monthly gross compensation are approx. of Rs.55,587. Applicable Fee is Non-Refundable and has to be paid only Online. All other bank transaction charges for Online Payment of application fees or intimation charges will have to be pay by the candidate. (i) For the selection in NABARD, you have to apply before the last date which is 10/07/2017. (ii) Read online details for more about selection process on NABARD recruitment 2017. Eligible applicants are required to apply online through website www.nabard.org. No other way or mode of job application will be accepted. The job application form should be filled in English language only. There will be an option to the user for the Hindi language will be available only for the online main examination or for Interview purpose. Candidates can apply online only till 10 July 2017 and no other offline mode of application will be eligible. For more details, you can read job description & details on the official website and apply online. The important date to remember to apply for this job is 10/07/2017. 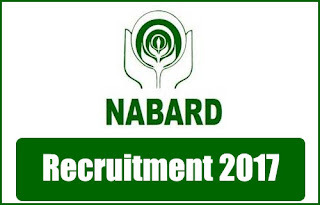 Apply now online at NABARD Recruitment 2017 job vacancy for Graduates & Post Graduates holder candidate can able to apply for Assistant Manager before the last date. Check out our Fresher, Govt, Graduate, Post Graduate, latest, Jobs vacancies and do share with your friends on Facebook, Twitter and other social websites those who want to work as an Assistant Manager in NABARD. Subscribe for more job offers.